Custom golf cart bodies are showing up more and more as people try to find something a little more unique and stylish than just a regular old E-Z-Go, Club Car or Yamaha cart. Wouldn’t it be a thrill to own a cart that looks just like a Cadillac Escalade, a Hummer, a Viper, or a ’57 Chev? Did you know that you could order a Bentley, Lamborghini, Mercedes, Rolls Royce or Corvette? In the marketplace today there are so many different body styles that it is almost impossible to list them all here. For the most part custom golf cart bodies are designed to bolt on top of the newer chassis of EZ-Go, Club Car or the Yamaha brands. Frequently people have asked us, “just how custom is custom?” Well the answer is simply, as custom as you would like. With the technology today in fiberglass, paint and available accessories there quite simply is nothing that can’t be built, for a price of course. The range of options spans the spectrum from a very simple cart modification starting at a few hundred dollars all the way up to the most exotic running in excess of $25,000! We will give you the most in-depth information and specs available online today in order to help you through the process. Whether you are an individual looking for something a little different for the golf course or you have a company that wants to differentiate itself from the others in your market we are sure we can shed some light on the appropriate answers. We highly recommend that before you get too far into your search that you compile a list of things that are important for your needs. 1)	What options or accessories are absolutely required to fill your needs in a customized cart? 2)	What options or accessories do you want to know more about? 3)	What options or accessories would be great if your budget would allow for them? 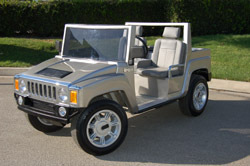 Once you have spent a few minutes itemizing your personal requirements then your search for one of the many custom golf cart bodies can begin in earnest. Is it strictly for the golf course? Are you going to take your cart off-road? Will it be driven on public roadways? Is there a need for 4 or 6 seats on the cart? Do you want a gas or electric model? Will you require a 16hp Kawasaki or 24hp Honda conversion? The next question that follows closely behind the first is what is your budget? Once these basics have been established then you move on to body style and accessories. As far as accessories go there are dozens of potential choices as well. Is there something here that you never considered but now think is a must? We find most people opt for some extra options once they have been exposed to the possibilities. Now is the time to splurge. The biggest regret we hear from people after they have used their new custom golf cart body is they wish they had ordered that one extra feature initially. Adding some accessories after the fact can look really crappy and sometimes just don’t really fit in at all. So if you are sitting on the fence about one or more options chances are you will be much happier down the road if they are installed at the factory. Custom Carts - Does everything from carts to motorcycles. Whether you are in the market for an upgrade or just a few extra accessories these guys have it covered.